Atlanta’s Love and Hip-Hop star, Benzino, was shot in the arm on Saturday in route to his mother’s funeral. The rapper was driving through Duxbury on Route 3 headed to St. Peter’s Church in Plymouth, Massachusetts. The shooter, Benzino’s nephew, was taken into custody and is being charged with armed assault with attempt to murder. The shooting took place about 11:55 a.m. Gunman, Gai Scott, was behind the wheel of his Bentley when he opened fire on 48-year-old Raymond Scott. Benzino is Raymond’s stage name and the one he is most known as. The bleeding rapper climbed out of his red SUV after he was shot to flag down a passerby. Initially Benzino was taken to the Duxbury Police Department but later to South Shore Hospital where he was slated in stable condition. According to Timothy J. Cruz, Plymouth County District Attorney, there has been a growing family tension between Benzino and Gai. Witnesses said they saw cars covered in blood; the hearse and another car. One witness said at some point during the processional, in route to Mary Scott’s funeral, the two cars were side by side. All of a sudden Gai fired several shots into Benzino’s Dodge SUV. 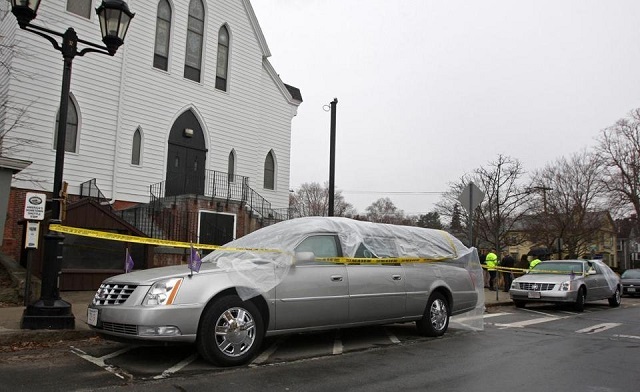 Investigators tended to the blood smudged hearse, which happened to be carrying Benzino’s mother. The hearse was covered in plastic and police tape as it sat outside of the church. The funeral was delayed, but eventually went on as planned. Route 3 in Duxbury had to be closed off for several hours during the police investigation. Investigators tended to the hearse, which was smudged with blood, covered in plastic and ringed by police tape outside the church. The hearse, which was now a part of a crime scene, had to be replaced with another hearse after the service ended. Gai, Benzino’s 36-year-old nephew, was arrested and will be arraigned in Plymouth District Court on Monday, March 31. Benzino is currently known throughout the world of hip-hop because of his tenure on the reality television show Love and Hip-Hop Atlanta. He has been a regular on the show since 2012. Before Benzino became a solo artist he was a member of the rap groups Almighty RSO and Made Men. The rapper made his mark in the industry as an owner of the Source magazine. The Source was a pioneering publication for hip-hop. During this time Benzino put out at least four albums. While working at the Source magazine he and the famed rapper, Eminem, ensued in a lengthy public feud which greatly tarnished the magazine’s reputation. After he left the Source he went on to start another magazine called Hip-Hop Weekly. According to CelebrityNetworth.com Benzino has a net worth of $10 million. The rapper, who was born in Boston, Massachusetts, earned his net worth primarily through his publishing and music career. Raymond “Benzino” Scott of Atlanta’s Love and Hip-Hop reality television show was shot in his right arm on Saturday by his nephew Gai Scott. The rapper and his nephew, although in separate vehicles, were both traveling in the funeral procession for Benzino’s mother. Scott fired several shots at Benzino; as a result he was arrested and charged with armed assault with attempt to murder. 7 Responses to "‘Love and Hip-Hop’ Star Benzino Shot in Route to Mother’s Funeral [Video]"
Rappers have to be the dumbest bunch in the world. No respect for anything. To bad for the nephew..the funeral is for his aunt…there must really be bad blood. It is a sad situation when your trying to put your mother to rest , someone is trying to put you to rest. No worries though ,God will take over.